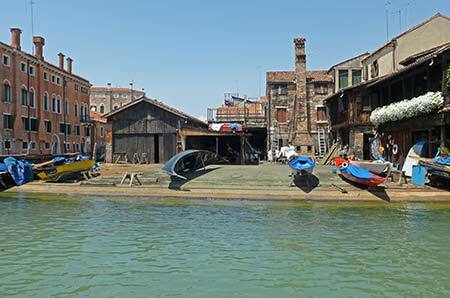 ABOVE: A view of the squero, or gondola boatyard, from the opposite bank of the Rio di San Trovaso. 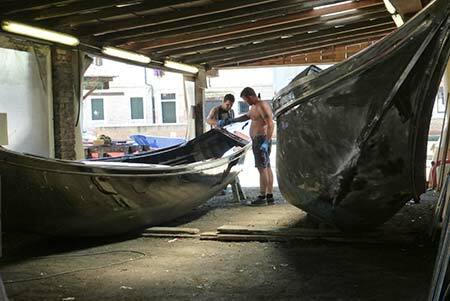 Venice has about 400 gondole in active service, and all are made by hand. A typical gondola is built from nine different types of wood and several hundred parts, including a carved oarlock called a forcola and a weighted bow ornament known as a ferro that helps to counterbalance the weight of the gondolier who rows while standing on the boat's stern. A gondola can cost upwards of €20,000, depending on its amenities, and it needs regular maintenance to ensure a working life of several decades. 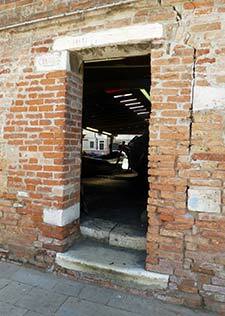 Gondola construction and repairs are supplied by a handful of squeri, or boatyards, in Venice and the Venetian Lagoon. 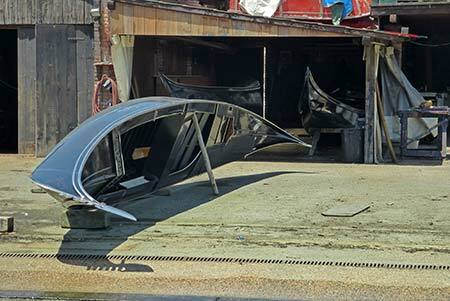 Most of these boatyards are in locations that tourists seldom see, but the oldest and most famous yard--the Squero di San Trovaso--is in the heart of the city. Although the squero isn't open to the public, anyone can enjoy a view of the gondola craftsmen at work from the opposite bank of the San Trovaso Canal. A freshly-painted gondola sits on the paved apron in front of the Squero di San Trovaso, facing the San Trovaso Canal. The telephoto lens on Cheryl's point-and-shoot camera let her get up close and personal with the artisans. Our article tells how to hire a gondola and what you can expect to pay. It also has links to other resources for gondola buffs.